This Süper Lig season could be a surprise. With Basaksehir a supposed underdog in the title race has long since arrived and could finally get the championship after two seasons, where they narrowly failed in the title race. The double burden of international competition has fallen away for Basaksehir already at the beginning of the season, but recently Basaksehir also dropped out in the Turkish Cup and can thus fully concentrate on the Süper Lig. The knockout against a second division, despite first-leg success, came as a surprise. On Monday, Basaksehir has the chance to restore the cushion in the Süper Lig in the duel of the Erdo clubs, against Kasimpasa. Will a tip on the Avci-Elf pay off against Kasimpasa at Basaksehir? With only two defeats on the account, Basaksehir is on the road this season. One of the two defeats had the team of Abdullah Avci but just plug in the duel against Kasimpasa. In the second half Basaksehir can now reciprocate for the defeat. Kasimpasa has been playing well so far this season and convinced with a strong offensive. No other team scored more goals in the first half than Kasimpasa. In the game between Basaksehir and Kasimpasa now meet the strongest defensive team and the strongest offensive team on each other. After Basaksehir could already decide the top match against Trabzonspor for himself, Basaksehir against Kasimpasa also a prediction in favor of the table leader would be appropriate. The kick-off will be on Monday evening at 18:00 in Istanbul! At the latest after the impressive opening round back it is clear: Basaksehir definitely plays for the title and has earned the bookmakers the current favorite role in the title race! At the Black Sea in Trabzonspor with such a dominant performance to secure a 4-2 away win, not even the traditional clubs have made it from Istanbul. For Abdullah Avci and Basaksehir, after two seasons in a row, where the title was narrowly missed, it could be this year. With only ten goals, Basaksehir’s defense is the strongest in the Süper Lig, with just four goals conceded in eight home games. Recently the Avci-Elf scored two goals in front of home crowd: Neither the home game against Sivasspor (1-0 home defeat) nor the top match against Galatasaray (1-1 draw) was won. If Basaksehir Vs. Kasimpasa should not pay the odds on a home win again, it would be the third home game in series without a win. Often Basaksehir could bring their three points with a strong defensive performance on the stage and has so far recorded eight wins to zero. The fact that the entire tactics of Avci but not based on defensive play, Trabzonspor has recently been felt. The Black Sea club had prepared for the strong defensive of Basaksehir, but the strong offensive of the championship leader was neglected. Basaksehir was also extremely effective. Eight of the ten shots from Basaksehir went to the opponent’s goal – four of them were ultimately a goal. In the last seven games Basaksehir has always made more than ten shots per game. Although statistically some teams can keep up, the overall package at Basaksehir was overwhelming. In the current squad, there were no shortcomings and yet Basaksehir strengthened in the winter with players such as Robinho, Tasci and Demba Ba. The traditional clubs of Istanbul can only dream of the current squadrons at Basaksehir. The transfer of striker Demba Ba was recently staged, but the Senegalese will not mind. It is quite possible that wagers could be made against Kasimpasa. Avci can draw on the full as possible in the game against Kasimpasa. Only the long-term injured Alparslan Erdem will be missing. The surprise team of the first round was undoubtedly Kasimpasa. With a superb offensive Kasimpasa could shoot one opponent after another and secured a place in the upper third of the table. For the first half of the performance, the performance was partially off, but Kasimpasa could still land on the final day of the first round, a 4-1 home win over Besiktas. In the previous Süper Lig season, there were only two games in which Kasimpasa has scored no goal. Kasimpasa’s recent goalless match also saw the poor offensive performance: bottom-finishing Rizespor won 1-0 at Kasimpasa. It seems that the offensive without Goalgetter Mbaye Diagne will not work. The Toptorjäger of this year’s Süper Lig season is still locked because of his spit action in the Turkish Cup against Alanyaspor two more games. The failure of Diagne gets Kasimpasa in full severity. Twenty of Kasimpasa’s 37 goals scored striker Diagne. The defensive performance of Kasimpasa was very poor with 29 goals, but in the end this could always compensate for the offensive. In the league, the team of Mustafa Denizli could win only one of the last five games. Kasimpasa’s otherwise strong offensive failed in the recent three games (cross-competition). Is the offensive gloss gone? According to recent media reports, Mbaye Diagne is in talks with his potential new club: the Turkish champions Galatasaray. If the rumor comes true, it could be a significant loss for Kasimpasa. The harmony in the team is true since the commitment of the experienced coach Mustafa Denizli. With Heintz, Toptik, Hajradinovic, Scuffet and Perica Kasimpasa has strengthened in this transfer window. Whether Perica should possibly replace the Goalgetter Diagne, remains uncertain at first. The game of Kasimpasa is partially pointed to Diagne, who has been able to deliver almost every season so far. In addition to Diagne, captain and center-back Sari are also missing. 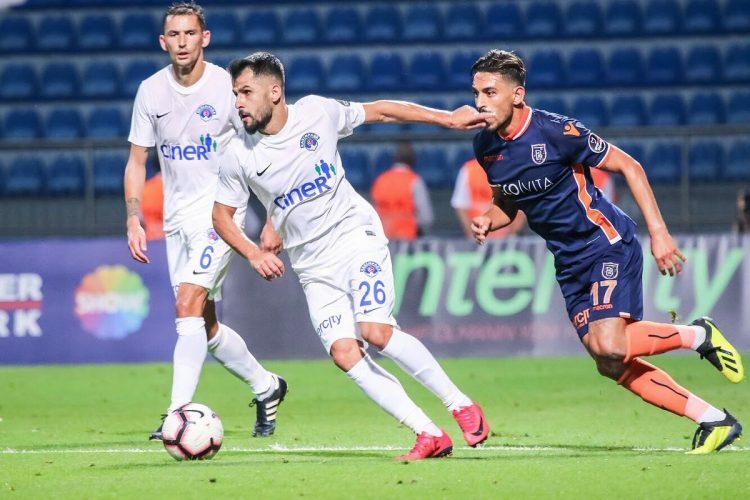 The strong basaksehir defense will not be an easy one for Kasimpasa’s current struggling offensive, so Basaksehir vs. Kasimpasa seems unlikely to score in favor of the visitors. For the 18th time Basaksehir and Kasimpasa will meet in the history. Basaksehir has a score of 10-2-5 against Kasimpasa. In the recent five duels between the clubs fell a total of 19 goals. On average, that would be 3.8 goals per game. Basaksehir has lost just once in eight home games against Kasimpasa. In the season 2012/13, when Basaksehir had to start the transition to the second Turkish league, home was lost at home against Kasimpasa. In the last season, both duels went to Basaksehir, in the first round of this season Kasimpasa could defeat 2-1 Basaksehir. Basaksehir is currently the measure of all things in the Süper Lig. In part, the opinion in terms of title race split again, because Basaksehir also played in the seasons before a strong first half, but then drowned in the second half again and again. This season Avci but a well-rehearsed team is available and also a squad, which is unparalleled in the Süper Lig. After the second half of the season against Trabzonspor with an impressive 4-2 victory succeeded, Basaksehir wants to continue at home against Kasimpasa. The guests from Kasimpasa, however, are struggling with the failure of Diagne and go, especially after the recent games, not exactly optimistic for the away game. With Mbaye Diagne missing at Kasimpasa top scorer this current season. Basaksehir started the second half with an impressive 4-2. Kasimpasa scored in the last three competitive games only one hit (in regular time). Denizli has not fortified himself with Kasimpasa for nothing. His team should stay in the upper third of the table and finish the season on a European grid. Whether Kasimpasa will succeed with that remains questionable. The strong offensive has so far always compensated for the weak defensive performance. If the offensive game bears no fruit, it looks poor for the Denizli team. In the away game against Basaksehir, we therefore also see the home side ahead. We would recommend to Basaksehir against Kasimpasa a tip on the home side, for which we choose a use of six units.